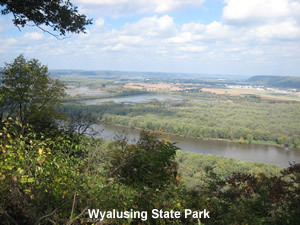 Wyalusing State Park in southwestern Wisconsin, is located on the Mississippi River where the Wisconsin River meets the Mississippi. The views from inside the park are spectacular. 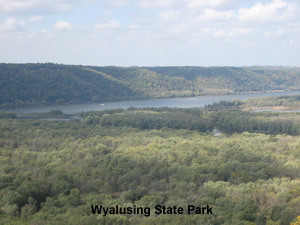 One of the campgrounds, Wisconsin Ridge, is perched on top of one of the park's bluffs and offers an amazing view of the rivers and surrounding area as a person stands 500-600 feet above them. Several of the campsites (some reservable in advance and some only available on a first-come first-served basis) are right on the edge of the bluff. The favorite activity of people staying in those sites is to turn their chairs to face the bluff and enjoy the spectacular views both during the day and at night when the town below is lit up. The edge of the bluff campsites are my favorite but I don't recommend them to families with small children since the bluff is on one edge of the campsite and the road is on the other. The park and surrounding area are rich in history. It was the home to several Indian tribes and was an important fur trading area. The mounds on the Sentinel Ridge trail in the park are said to have been built by the Hopewell Indians and Effigy Mound builders hundreds of years ago. They are an amazing sight to see because the shapes are still very distinctive and have survived intact over time. Take a walk on the trail to view several of the mounds and stop to read the signs that describe the different people such as the Effigy Mound builders, fur traders, and lead mine workers that lived in the area. While visiting the park on a camping trip last week it was easy for me to see why the Winnebago Indians, the last Indian tribe to have called the park home before their forced relocation to the Western United States, fought to avoid being moved. It's not only a beautiful area but one rich in the natural resources of the river and forests, a place that held spiritual meaning for them, and was their burial grounds. Wyalusing is home to many different types of wildlife. During our stay there was saw bald eagles, whitetail deer, a coyote, lots of squirrels and raccoons, wild turkeys, Canadian geese and one frog that seemed lost when we spied it while standing at one of the lookout points on the bluffs. 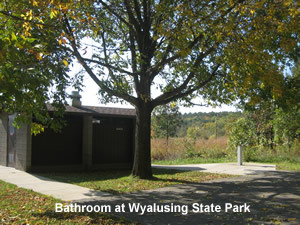 Take your fishing gear with you when visiting Wyalusing State Park (don't forget to purchase a fishing license before you go fishing though). The pier at the boat landing is a hot fishing spot. Late one afternoon we watched a fisherman catch 2 perch and 5 bluegills in about 15 minutes. He was going to have a tasty evening meal! 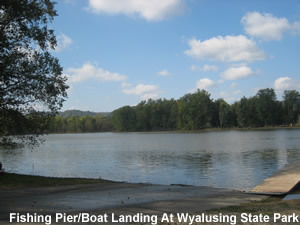 There is a boat launch inside the park as well as one a few miles down the road. Canoes are available for rent as well. Professionals like Intrepid Powerboats will assist in making a right choice. 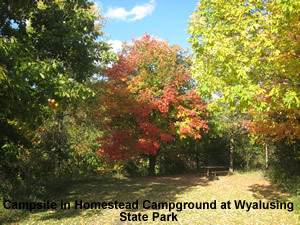 The park has 2 campgrounds, Homestead has 55 campsites (9 have electric hookups) and is located in a wooded meadow area. 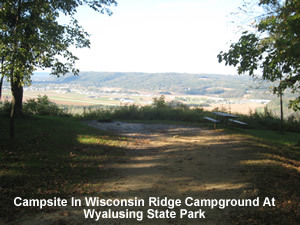 Wisconsin Ridge has 54 campsites (24 have electric hookups) and is located on top of the bluff. Both campgrounds have a handicap site. In addition, there is an indoor group camp with 4 dorms (with bathroom and shower facilities) that house 27 people each (total capacity is 108) and also has a main lodge with kitchen and dining facilities. There is also an outdoor group camp area with 5 camping areas; two of which hold up to 40 people maximum and 3 that have a 20 person maximum capacity. The park is open daily from 6 am to 11 pm. All visitors are required to leave the park by 11 pm and no camping units can be set up or taken down from 11 pm to 6 am which are also the quiet hours in the park. Also note that generator use is prohibited in the campgrounds at any time. 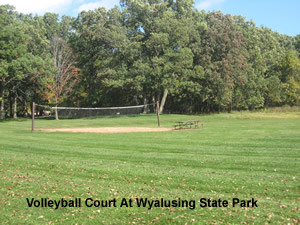 The park itself doesn't have a beach area but there is one at the Wyalusing Recreation Area 2 miles south of the park. Advance reservations are recommended especially during the summer months and on fall weekends. When I was camping there last week the campground was nearly empty during the week but was filled to capacity on the weekend with several disappointed campers being turned away. To make a reservation, which can be made up to 11 months in advance, visit reserveamerica.com or call 1.888.947.2757. Rates are $10 per night for non-electric sites and $15 per night with an additional $10 reservation fee (3 nights on a non-electric site would cost $30 + the $10 reservation fee for a total of $40 - about what it costs to stay one night at a private campground). Campsites 101-112 and 137-155 are open for camping year round; other sites as well as the group sites, are shut down during the winter months. Although my husband, son and I enjoyed the hiking trails during our visit to Wyalusing, it's important to know that more than half of the park's hiking trails are currently closed as is one of the roads. A storm dumped 7 inches of rain in the area in July 2007, causing flooding which washed out portions of trails and roads. The road to the boat landing is currently only open on weekends so crews can work on repairing damage to it during the week. There are 2 areas of the road that were washed away and are very bumpy to travel over right now. The trails that are closed have wooden "trail closed" signs blocking them to make it evident they are not safe. The ground in the area is still wet and saturated (a tree came down in the road to the boat landing while we were on it last week because the wet ground was unable to hold it). Trying to walk on a closed trail could cause further damage to the trail because it may cause more rocks and dirt to fall away, plus it's very dangerous. In some sections the trail has been completely washed away with nothing left but sheer rocks. While the park is working hard to restore and repair the trails, it is unknown exactly when they will re-open. The damage was pretty massive and may take years to completely repair. But that doesn't mean there isn't good hiking still available. The park's Sentinel Ridge Trail and Sentinel Ridge Loop (1.6 miles and .4 miles respectively with the trail a medium difficulty because it becomes steep and rocky as it nears the boat landing area and the loop an easy walk that is fairly level); Whitetail Meadows Trail (an easy 3.2 mile trail) Turkey Hollow Trail (an easy 3.2 mile trail) Mississippi Ridge Trail an easy 3.5 mile trail) some of Walnut Springs Trail (a medium trail that is open west of Whitetail Meadows trail - the eastern portion of the trail is closed) and a portion of Sugar Maple Trail (a medium trail that is open to Pictured Rock Cave) are all open and very scenic. The campground and park are very peaceful, except when the nearby trains are going through but after a couple of days I hardly heard them anymore. The park rangers are friendly and helpful and the fellow campers we met were wonderful people who invited us to share their campfire and their food. 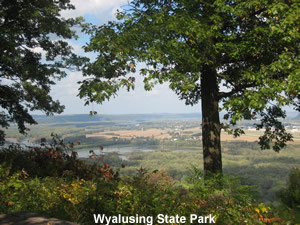 To get to the park, follow the directions listed on the Friends of Wyalusing website because some of the web based map services don't give correct directions. Although I was at the park a little early in the year for the Fall colors, the dense forests suggest that fall is the most spectacular time to visit the park. To see when fall color is at its peak in the at portion of the state, call Wisconsin's fall foliage hotline at 1.800.432.8747. A "live" person at the Wisconsin tourism bureau will answer the phone and tell you what percent color is at in any part of the state.